The thing I remember most about Rachel and John’s wedding was the adoring way they looked at each other all day long, you could tell that they couldn’t wait to say “I Do” and start their marriage. 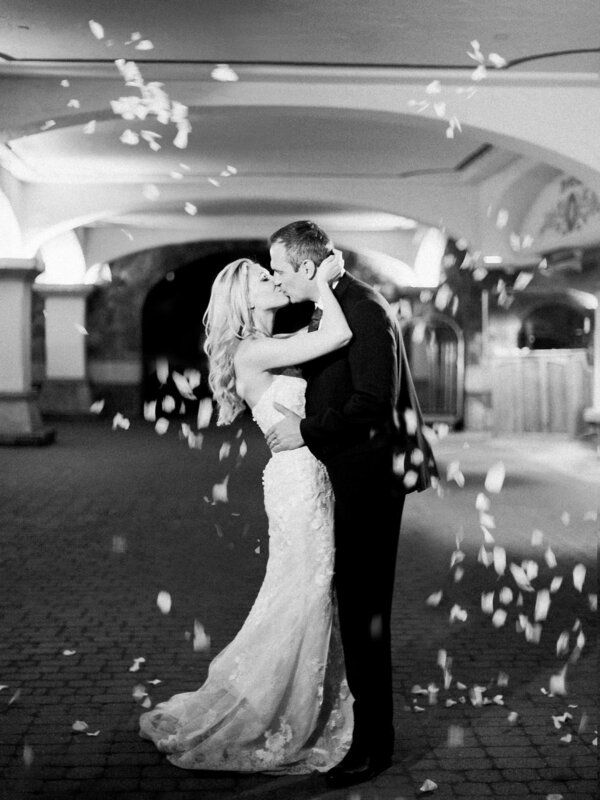 They couldn’t have chosen a more perfect location than Vail, Colorado in June for their wedding, and Sara Lynn and DaCosta Films captured it perfectly! Be sure to check out the video - it includes a pedicab ride, gondola ride, and footage at the very top of a mountain in Vail! Rachel and John live on the East Coast but decided to host their wedding in Colorado, where John grew up and his parents still live. Because they both have incredibly demanding jobs (and were in the process of a move from the Mid-Atlantic to New England, Rachel knew she needed some help to pin down remaining vendors and finalize the planning process. She had already done a great job deciding on the feel of her wedding, her colors, and booking some incredible wedding professionals, and together (with the help of John’s mom) we were able to finish finding her creative team and design a day filled with merriment! Rachel and John both got ready at The Sonnenalp Hotel in Vail, Rachel using their wedding suite and John decamping to a friend’s room. Rachel wanted to make sure that the overall feel of her wedding was classic and elegant; the gown and accessories she selected were the perfect styles for a mountain elegant wedding! 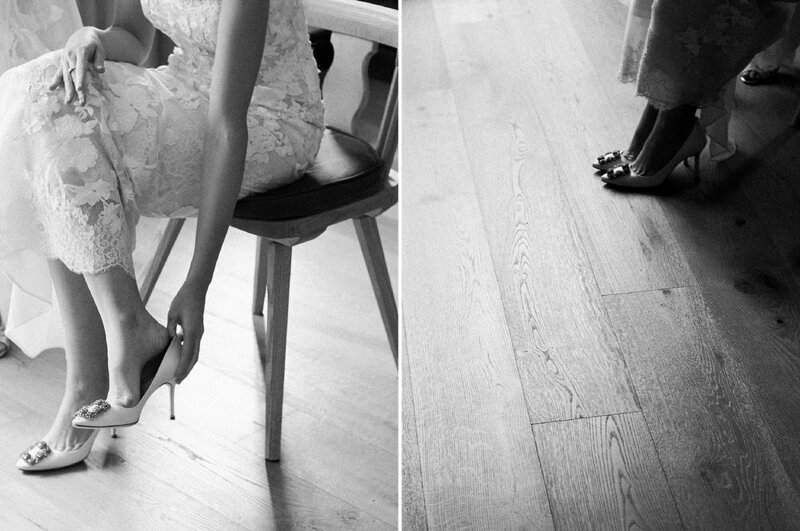 Her Manolo Blahnik Hangisi wedding shoes are a classic style, the style that Big gave to Carrie in the closet of their new apartment! Rachel and John gave each other “love knot” accessories on their wedding day: a ring for her and cufflinks for him. They selected a watercolor monogram invitation from EVR Paper that included a beautiful painting of Vail Village. The couple wrote each other letters to exchange before the First Look, the perfect memento to keep and revisit for years to come. Rachel and John decided to have a First Look so that they could have a bit of a private moment, spend some time with just each other, and maximize the amount of time they would have for photography. The Vail Interfaith Chapel sits next to Gore Creek, making it the perfect location for a First Look and wedding portraits. 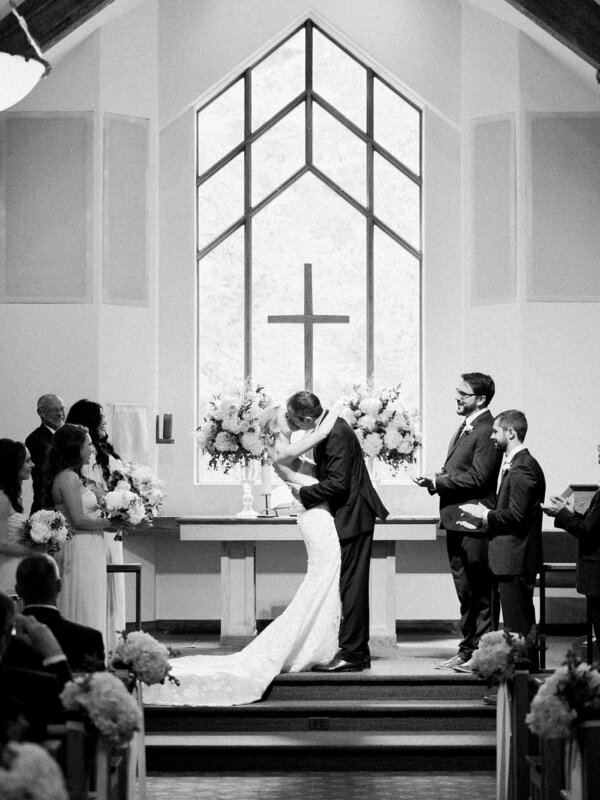 I am not sure I have ever seen a groom hug his bride as tightly as John did to Rachel when he first saw her. The moment was absolutely perfect! 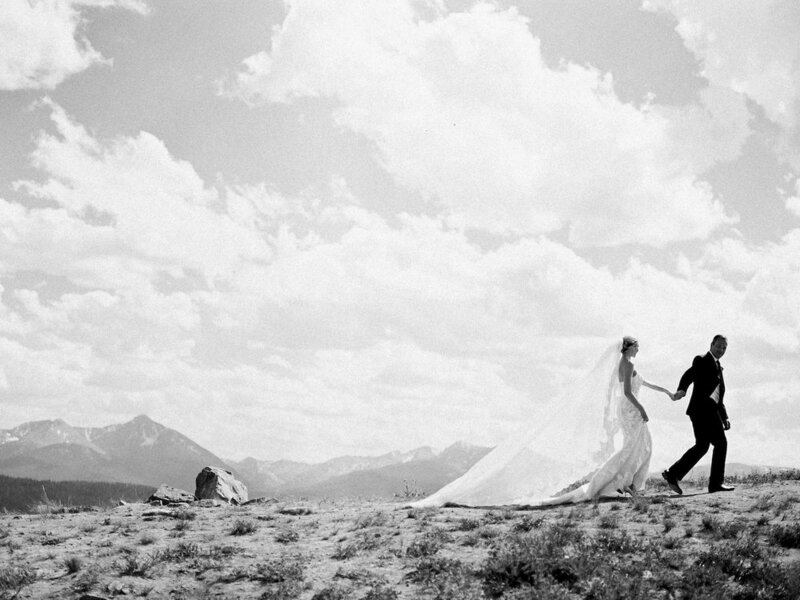 Rachel and John were married at the Vail Interfaith Chapel just across the street from The Sonnenalp. Rachel’s grandparent’s bible was used as the “ring pillow” and their programs featured a watercolor painting of the chapel by EVR Paper. Their two flower girls and ring bearer were amazing, the sweetest additions to their wedding party. Sticking with tradition, Rachel walked down the aisle to Bridal Chorus by Wagner. The couple kept their ceremony decor classic and elegant, with clusters of hydrangea lining the aisles and two large arrangements filled with roses, peonies, and greenery decorating the altar, all created by Vail Vintage Magnolia. Following the ceremony, the guests gathered on the front steps of the Chapel for a petal toss and a group photo. One of the most important things to Rachel and John was making sure that they were able to take portraits on top of one of Vail’s peaks. The Sonnenalp Hotel and Vail Interfaith Chapel are located in Vail Village, but the Gondola is located in Lionshead. Though only separated by a mile, we had to come up with a creative way to cross from Vail Village to Lionshead because Vail is a city designed to be walkable; many streets are closed to cars and parking is fairly limited. Because we had some time constraints (not wanting the cocktail hour to be too long), I came up with the idea to rent Pedicabs. Bicycles can make the trip from the Chapel to the Gondola in about half the time walking or driving would take! We worked with Vail Pedicab to make this vision come to life and couldn’t have made a better choice. The pedicabs (we needed three pedicabs: the couple, the photographers, the videographer) were waiting for us at the end of the ceremony and prepared to zip off as soon as our group photo was finished. They even had a “just married” sign for the couple’s pedicab. Transporting everyone this way had an added benefit: the couple had some time to spend alone immediately after the ceremony. Rachel declared the pedicab ride to be her favorite part of the day, something you can see reflected in the photos of this moment! The pedicabs dropped Rachel, John, and the photographers and cinematographer off right at the base of the Gondola (pro tip: purchase lift tickets in advance so there is no wait). Rachel and John were able to have their own, private gondola for a little more alone time. The resulting mountaintop photos were worth the extra coordination! The views are stunning and Rachel and John have magnificent portraits on top of the world! While the couple was spending time taking photos on the very top of a mountain, guests were gathered for cocktail hour at the pool at The Sonnenalp. One of the best aspects of having a wedding at The Sonnenalp is that the beautifully landscaped grounds and incredible baskets of flowers mean that cocktail hour decorations can be kept to a minimum. Rachel and John decided to punch up the fun by offering custom temporary tattoos featuring sketches of their smiling faces and two delicious custom cocktails. The Sonnenalp was able to source sparkling rose wine for Rachel’s “Blushing Bride” cocktail, a play on a French 75. And John selected one of my favorite cocktails: a Gold Rush, the perfect light bourbon drink for a warm Summer day! To decorate the reception space, Rachel and John had Vail Vintage Magnolia add greenery to incredible chandeliers in Ludwig’s Restaurant, the glass-ceilinged space in The Sonnenalp. The ceremony arrangements were repurposed to flank the couple’s sweetheart table. The elegant linens from Event Rents and classic centerpieces (filled with roses and hydrangea) were the perfect touch to the old-world, European setting of The Sonnenalp. Guests wrote notes and advice to the couple on Kate Spade “confidentially speaking” note cards as a fun twist on a guest book. The Sonnenalp created a timeless wedding cake and as a nod to the fact that the Groom’s parents are from Europe, they included a Sacher tier, a chocolate flavor popular in Austria. In addition to the cake, the couple selected a chocolate fondue dessert station, full of delicious bite-sized morsels guests could nibble on. The Sonnenalp’s glass roof can open for weddings (if weather permits), so guests were able to dance under the stars. As one final treat, Rachel and John gave guests cookies decorated with their initials and a tiny bottle of bourbon as a nightcap. Working with these two was one of the greatest pleasures of my career, they are two of the kindest people I have ever met! Be sure to check out the publication on Rocky Mountain Bride that featured this day and the short video of their incredible wedding at The Sonnenalp in Vail.